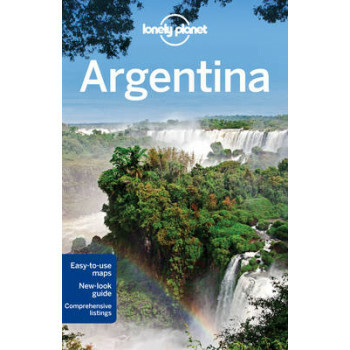 #1 best-selling guide to Argentina* Lonely Planet Argentina is your passport to the most relevant, up-to-date advice on what to see and skip, and what hidden discoveries await you. Watch gauchos prance across the pampas, take a tango lesson in Buenos Aires, or listen to the primal roar of Iguazu Falls; all with your trusted travel companion. Get to the heart of Argentina and begin your journey now! Inside Lonely Planet's Argentina Travel Guide: *Full-color maps and images throughout *Highlights and itineraries help you tailor your trip to your personal needs and interests *Insider tips to save time and money and get around like a local, avoiding crowds and trouble spots *Essential info at your fingertips - hours of operation, phone numbers, websites, transit tips, prices *Honest reviews for all budgets - eating, sleeping, sight-seeing, going out, shopping, hidden gems that most guidebooks miss *Cultural insights give you a richer, more rewarding travel experience - history, art, literature, cinema, music, politics, landscapes, wildlife, cuisine, wine *Free, convenient pull-out Buenos Aires map (included in print version), plus over 60 color maps *Covers Tierra del Fuego, Patagonia, Bariloche, Lake District, The Pampas, Atlantic Coast, Mendoza, Central Andes, Buenos Aires, Uruguay, Cordoba, Central Sierras, Iguazu Falls, Salta and more The Perfect Choice: Lonely Planet Argentina, our most comprehensive guide to Argentina, is perfect for both exploring top sights and taking roads less traveled. * Looking for a guide focused on Buenos Aires? Check out Lonely Planet's Buenos Aires guide for a comprehensive look at all the city to offer. Authors: Written and researched by Lonely Planet, Sandra Bao, Gregor Clark, Carolyn Marie McCarthy, Andrew Symington and Lucas Vidgen About Lonely Planet: Since 1973, Lonely Planet has become the world's leading travel media company with guidebooks to every destination, an award-winning website, mobile and digital travel products, and a dedicated traveler community. Lonely Planet covers must-see spots but also enables curious travelers to get off beaten paths to understand more of the culture of the places in which they find themselves. *Best-selling guide to Argentina. Source: Nielsen BookScan. Australia, UK and USA, February 2013 to January 2014.